Citation Information: JCI Insight. 2019;4(5):e122311. https://doi.org/10.1172/jci.insight.122311. Epithelial ovarian cancer (EOC) often presents with metastases and ascites. Granulocytic myeloid–derived suppressor cells are an immature population that impairs antitumor immunity. Since suppressive granulocytes in the ascites of patients with newly diagnosed EOC were morphologically mature, we hypothesized that PMN were rendered suppressive in the tumor microenvironment (TME). 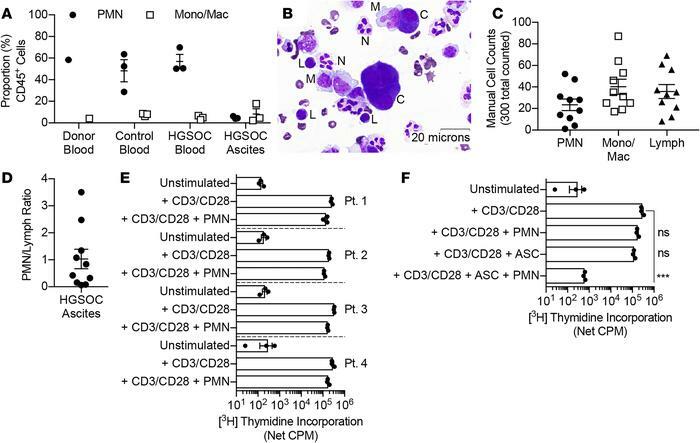 Circulating PMN from patients were not suppressive but acquired a suppressor phenotype (defined as ≥1 log10 reduction of anti-CD3/CD28–stimulated T cell proliferation) after ascites supernatant exposure. Ascites supernatants (20 of 31 supernatants) recapitulated the suppressor phenotype in PMN from healthy donors. T cell proliferation was restored with ascites removal and restimulation. PMN suppressors also inhibited T cell activation and cytokine production. PMN suppressors completely suppressed proliferation in naive, central memory, and effector memory T cells and in engineered tumor antigen–specific cytotoxic T lymphocytes, while antigen-specific cell lysis was unaffected. Inhibition of complement C3 activation and PMN effector functions, including CR3 signaling, protein synthesis, and vesicular trafficking, abrogated the PMN suppressor phenotype. Moreover, malignant effusions from patients with various metastatic cancers also induced the C3-dependent PMN suppressor phenotype. These results point to PMN impairing T cell expansion and activation in the TME and the potential for complement inhibition to abrogate this barrier to antitumor immunity. Ovarian cancer ascites induces circulating patient PMN to become suppressive. (A) The proportion of circulating WBC populations in a healthy donor (n = 1), control female patients undergoing surgery for a benign peritoneal mass (n = 3), and patients undergoing surgery for newly diagnosed HGSOC (n = 3) are similar but differ markedly from WBC populations in paired HGSOC ascites (n = 3). (B–D) Cytologic analysis of Wright Giemsa–stained cytospins of ascites from newly diagnosed HGSOC (n = 10). (B) Representative image showing mature PMN (N), monocytes/macrophages (M), lymphocytes (L), and tumor cells (C). All PMN were morphologically mature with characteristic segmented nuclei. (C) WBC proportions were quantified. PMN, 4%–52%; monocytes/macrophage, 17%–87%; and lymphocytes, 8%–69%. (D) Mean PMN/lymphocyte ratio was 1.03 (95% CI, 0.21–1.8, SEM 0.4). (E and F) T cells (CD3+) and PMN were isolated from patient blood and used in autologous coculture at 1:1 based on data in D (n = 4). PMN and/or ascites supernatants (ASC; 50% final well volume) were added to anti-CD3/CD28–stimulated T cells. After 72 hours of coculture, T cell proliferation was measured by [3H] thymidine incorporation (16–18 hours). (E) HGSOC patient circulating PMN were negligibly T cell suppressive. (F) ASC are not suppressive alone but induce patient PMN to suppress stimulated T cell proliferation by a factor of 2.08 log10 (95% CI, 1.26–2.90). Symbols represent individual samples (n), and bars represent ± SEM. Statistical comparisons were by ANOVA with Tukey post hoc test (***P < 0.001).